Simple and delicious Halloween Cookie Cake recipe on Super easy! 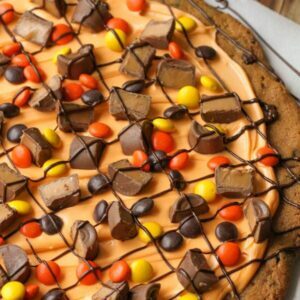 A refrigerated cookie dough baked, then topped with orange frosting, reeses pieces, rolos, and chocolate syrup. Begin by preheating oven to temperature on cookie roll. Line a large jelly roll pan with parchment paper. Take out cookie dough from package and press together. Roll out until it's a circle that is about ¼ inch thick. Cook 14-16 minutes or until golden brown. Frost cookie with orange (or any other color) of frosting. Top with cut up Rolos and Reeses Pieces.